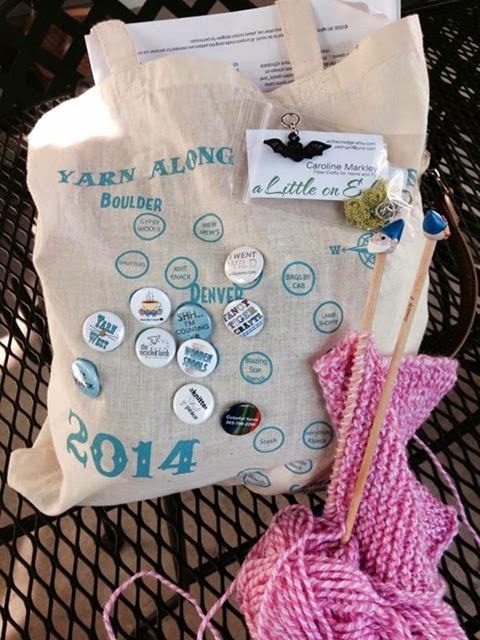 This past week here in Denver we had the "Yarn Along the Rockies" yarn crawl. This year's crawl included 24 stores ranging from as far north as Lafayette, to as far south as Colorado Springs. I had initially decided to hit just two or three stores and ended up visiting a baker's dozen. Along the way, I visited some old favorites and made some new discoveries as well. I did not limit my purchases to just yarn. My purchases included, stitch markers, dragon scales, fancy knitting needles and alpaca earrings. I clocked many miles traveling up and down the Front Range and was thankful for a wonderfully fun book I was listening to on Audible books. I was also glad to be able to share the last day of the trek with my husband. We combined yarn crawling with a wonderful lunch in Boulder a an incredibly good pub called "Fate". While all of the stores were charming in their own way, I just had to take a few pictures at a cute store in Lafayette called "Mew Mews". 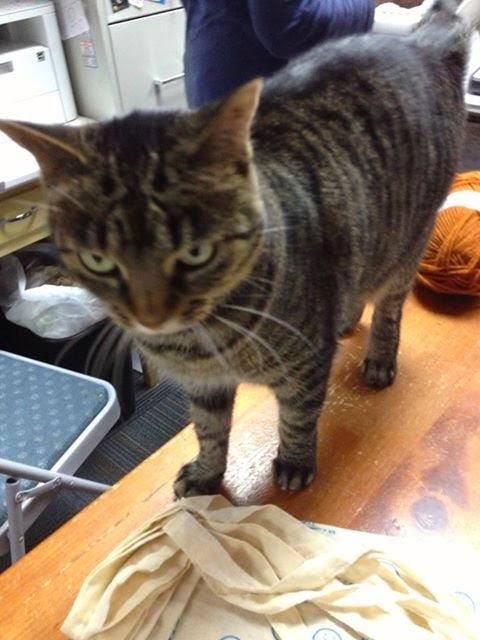 The store is named after the cat who is as sweet and friendly as can be. I offered a swap of three of my cats for her but the owner said no deal. I had to settle for a picture. In the corner of the store stood a knitted figure about 6 feet high. It was simply incredible. The details were astonishing. When I looked closely there were tiny mice being held in one of his hands, no doubt food for the snowy white owl he held in his other hand. 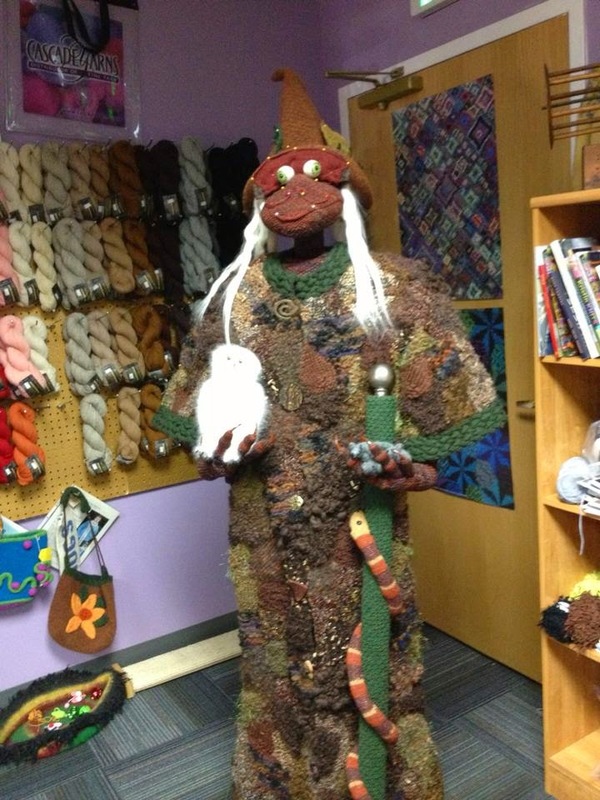 I have seen this fiber artists work before at her booth at Denver Comic Con and never realized that she was based out of this tiny store in Lafayette. I met some lovely store owners and had some fun conversations along the way. I would have to say that my favorite "yarn crawl experience" was at a store called "A Knitted Peace"
(http://www.aknittedpeace.com) They were so well prepared to welcome the many visitors. I was particularly thrilled to see a huge cooler full of icy water bottles that were a welcome treat on such a warm day. Their pattern was beautiful and available online or as a quality printed pattern. When I purchased my yarn crawl bag it was full of goodies that included some things that were useful to the yarn crawler such as a pen and paper pad so you could note down your favorite yarns and such for future purchases. I also appreciated the discount coupon they included in the bag for use on a return visit. Best of all was the incredible yarn selection. I'm pretty sure I bought too much yarn but how could I resist?